Cherries. Glorious cherries. It’s rare that I get to actually make anything with them, as they usually get eaten within hours of bringing them home from the grocery store. But on rare occasions it does happen, and the results that ensue are usually out of this world. Case in point? This Black Forest Tart. 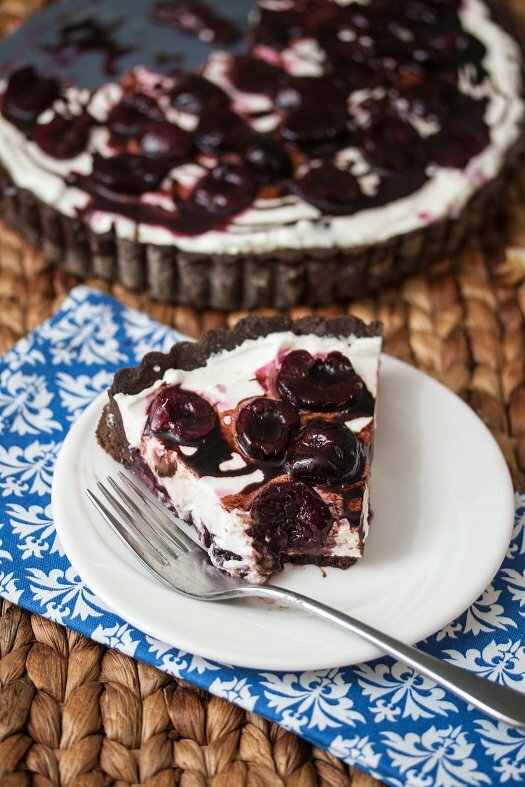 A rich chocolate crust, a light fluffy whipped cream filling, and plenty of delicious roasted cherries. Roasting fruit is a great way to reduce the water content, and intensifying flavor at the same time. That way you don’t end up with a waterlogged tart! For as decadent and over-the-top as it looks, it was surprisingly light to the palette. Which, is perfect for these hot summer evenings when you want something sweet – but don’t want something that’s sure to weigh you down. And, let me just advise to go ahead and make the homemade chocolate syrup. It’s pure perfection drizzled over this dessert. You won’t regret it, I promise. To make the tart shell, whisk together the egg yolk, cream and vanilla in a small bowl; set aside. Place the flour, cocoa powder, sugar, and salt in a food processor. Process briefly to combine. Scatter the butter pieces over the flour mixture; process to cut the butter into the flour until the mixture resembles coarse meal, about fifteen 1-second pulses. (Note: This can just as easily be done with a stand mixer or by hand with a pastry cutter.) With the machine running, add the egg mixture and process until the dough just comes together, about 12 seconds. Turn the dough onto a sheet of plastic wrap and press into a 6-inch disc. Wrap in plastic wrap and refrigerate at least 1 hour or up to 48 hours. Increase the oven temperature to 450 F. Combine the cherries and sugar in a baking dish. Toss to combine. Bake for about 10 minutes, until the cherries have softened slightly and start to release their juices. Let the cherries cool completely before assembling the tart. In the bowl of a stand mixer fitted with the whisk attachment, combine the heavy cream and confectioners’ sugar. Whip on medium-high speed until medium-stiff peaks form. Blend in the vanilla. Spoon about two-thirds of the roasted cherries into the cooled tart shell to form an even layer. Top with the whipped cream and smooth into an even layer over the cherries. Spoon the remaining cherries over the top of the whipped cream. If desired, drizzle a bit of chocolate syrup over the top. Refrigerate until ready to serve. This looks so flippin good! I love chocolate and cherries together … one of my favorite flavor combinations. And I rarely get to cook with cherries because we eat them so fast too! That tart is just beautiful!! Glad you enjoyed this! I just made it again last weekend – love this one!